This lovely new 10 month BOM program is adapted from the Mineral Matrix, a quilt designed by Toni Steere of a Wing and a Prayer Designs. The quilt is made up of 16 blocks (12 different blocks), sashing plus the 4 corner setting units. 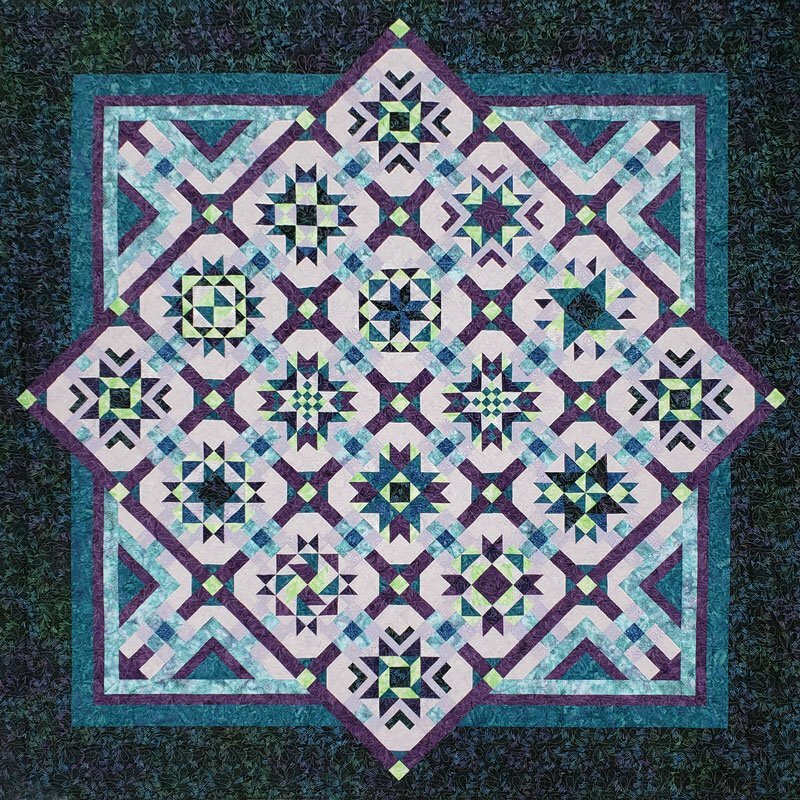 The kit offered uses 10 different batik fabrics in the shades of blue, purple, and green. Each month Jean and Millie will provide a thorough demonstration and helpful hints for your successful completion of this stunning quilt top. Kits will be available in the colors shown or you may select your own fabrics. The fabric kit for this Block of the Month program will include all the fabrics for the top, borders, and binding. This project makes a 108” x 108” king sized quilt. The registration fee is $50. Then each month the pattern, class and fabric fee is $40 or $10 per month for pattern and class only. You may elect to attend the classes or have the kits and pattern shipped automatically. What a great way to enhance your piecing skills over the next months and create this gorgeous quilt. Please sign up soon, as we have a limited number of kits available. Jean S. & Millie K.